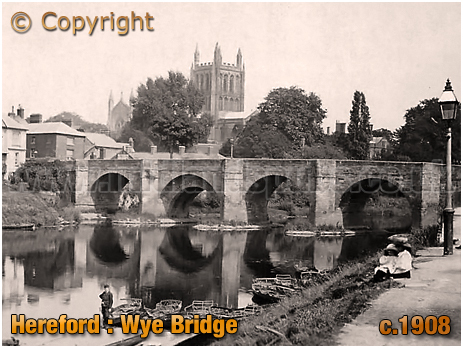 History and Information on Hereford in the County of Herefordshire. More information on Hereford to follow. I probably created the page as I had a link to Hereford from another page. When building the site it is easier to place links as they crop up rather than go back later on. I realise this is frustrating if you were specifically looking for information on Hereford. There is information on Herefordshire dotted around the website - click here for a suitable starting place. More information on Hereford to follow. 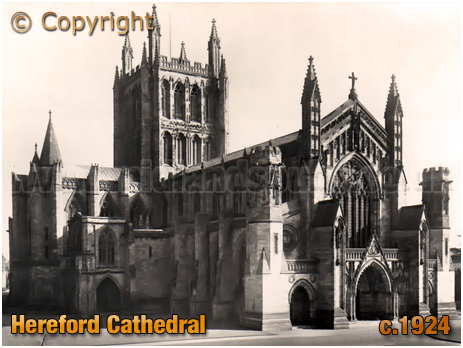 If you have a genealogy story or query regarding Hereford you can contact me and I will post it here in addition to including your message within the website pages for Herefordshire Genealogy. If you would like to share any further information on Hereford - perhaps you drank in one of the pubs in the past? Or maybe knew a previous publican running one of the boozers? Whatever the reason it would be great to hear of your stories or gossip. Simply send a message and I'll post it here. "On Monday last, an inquest was held by N. Lanwarne Esq., upon the body of John Whitmore, collector of tolls at the Mordiford Turnpike Gate, who destroyed himself on Saturday by hanging. The deceased was very honest, civil, and well-disposed man, but it appears that his wife was in the habit of leaving him, getting into debt, and indulging in intoxicating drinks. In consequence they had frequent quarrels, and there was nothing like domestic happiness. On Saturday afternoon, someone told the unfortunate man that his wife was rolling about the streets of Hereford drunk, and about five o'clock the same evening he was found dead in the turnpike house having hanged himself. The feet were almost touching the ground at the time he was discovered, but all attempts at resuscitation failed. Verdict, Temporary Insanity. It will be seen in our police report that the unfortunate man's wife was incarcerated in the station-house, in this city, from Saturday afternoon until Monday morning, she having been found in the streets by the police intoxicated and totally incapable of taking care of herself." "Consequences of a Wife's Intemperance"